Subaru has seen record sales every year since 2009, and while the Japanese carmaker has always had an offering in the competitive midsize sedan market, the Legacy has not contributed much to those record sales. 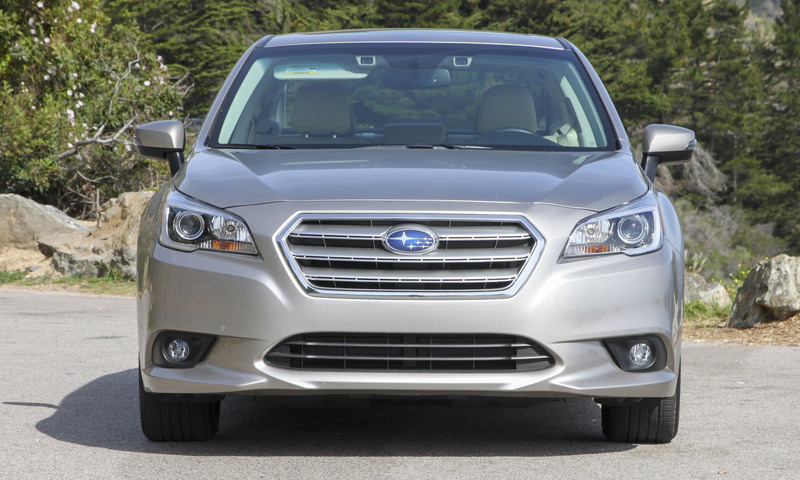 The folks at Subaru are hoping this new Legacy will change that. Completely new with fresh styling, an updated interior and excellent chassis – not to mention Subaru’s signature Symmetrical All-Wheel Drive – there’s nothing preventing this sixth-generation Legacy from gaining popularity and market share among midsize sedan buyers. The Legacy is available in four trims ranging from the entry-level 2.5i to the top-level 3.6R. 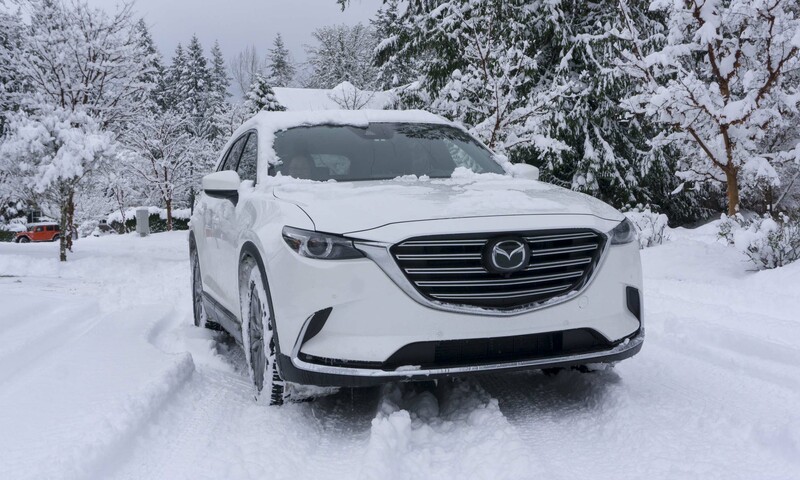 At a starting price of $21,695, the 2.5i is well equipped with standard remote keyless entry, stability and traction control, 17-inch wheels, incline start assist, multiple airbags with rollover sensor (including a new seat-cushion airbag) and a 6.2-inch multi-function display featuring HD radio, CD player and STARLINK smartphone integration with Aha, Pandora and iHeart Radio. A rearview camera is also standard on all Legacys. For an additional $1,800, buyers can upgrade to the 2.5i Premium, which adds an upgraded infotainment system with a 7-inch touchscreen display and multi-touch gesture controls, voice-activated controls, a 6-speaker audio system, SiriusXM satellite radio, SMS text messaging, iTunes Tagging capability, dual USB ports and vehicle information display. 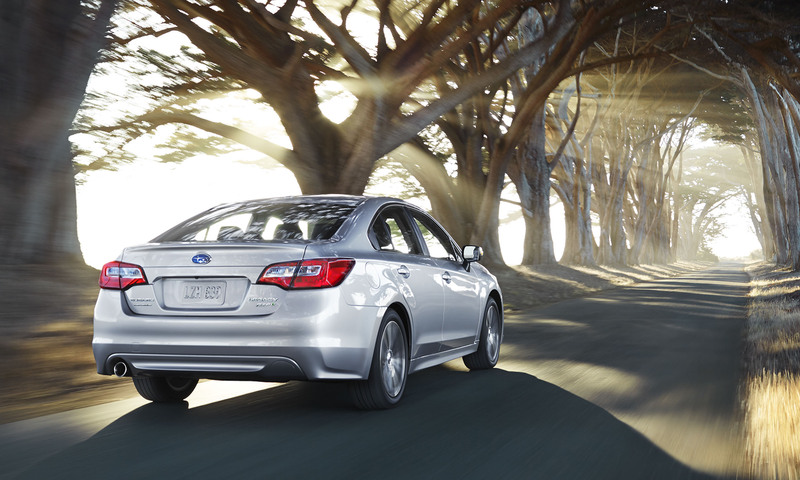 Subaru’s Eyesight driver assist system — improved for 2015 — is available on the Premium, as is GPS navigation, a rear-vehicle detection system and a power moonroof. 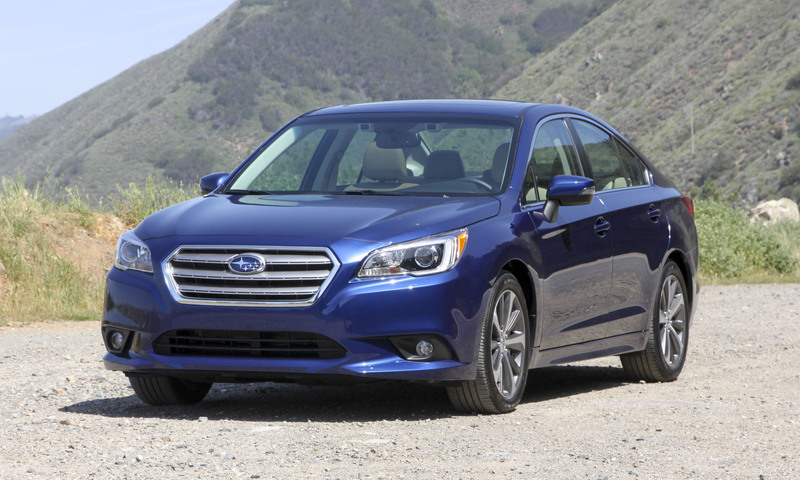 Subaru expects the 2.5i Premium to make up the bulk of Legacy sales. Priced at $26,495, the 2.5i Limited comes fully loaded, adding to the Premium with a 10-way power driver’s seat, 18-inch alloy wheels, a 576-watt Harmon/Kardon premium audio system, heated front and rear seats, fog lights and leather upholstery. The top-level 3.6R Limited starts at $29,595. In addition to the more powerful engine, the 3.6R gets dual-exhaust, HID headlights and larger brake rotors in front. 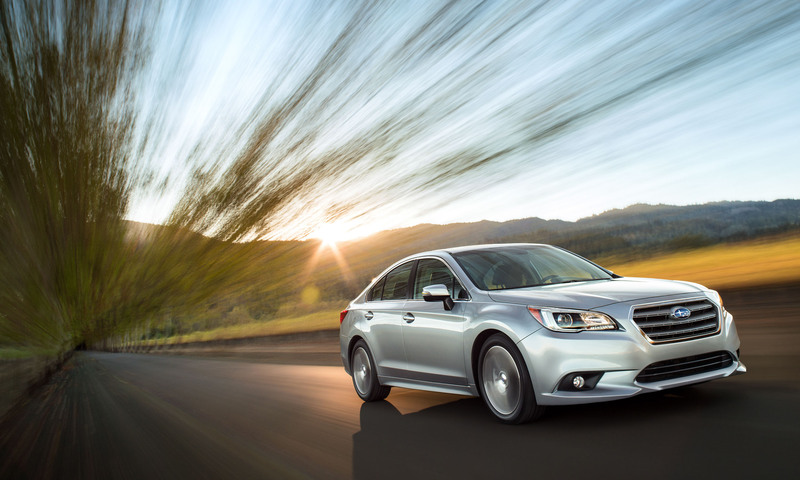 Two engines are available for the 2015 Legacy: a 2.5-liter four cylinder or a 3.6-liter six cylinder; both have a horizontally-opposed (boxer) configuration, which has been a Subaru staple for years. 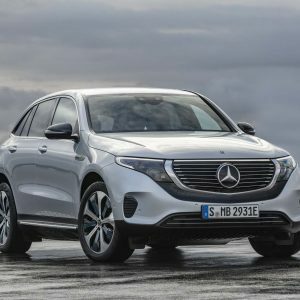 The 2.5-liter 4-cylinder unit produces 175 horsepower (a slight increase over the previous generation) and 174 lb-ft of torque, while the 3.6-liter 6-cylinder powerplant bumps up to 256 horsepower and 247 lb-ft of torque. 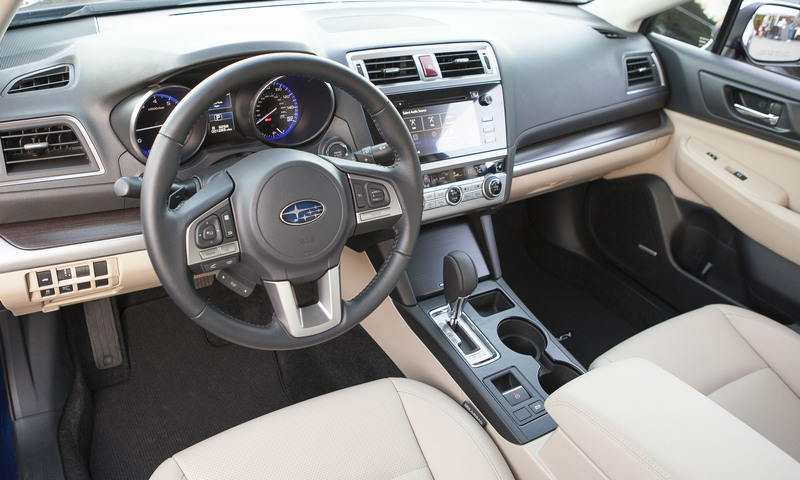 Both engines are teamed with Subaru’s continuously-variable transmission (CVT), which features a 6-speed manual mode and steering column-mounted paddle shifters. 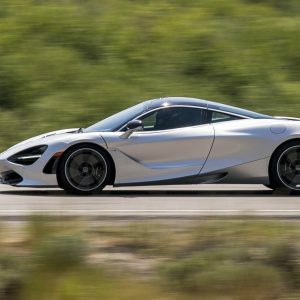 The manual transmission has been discontinued. 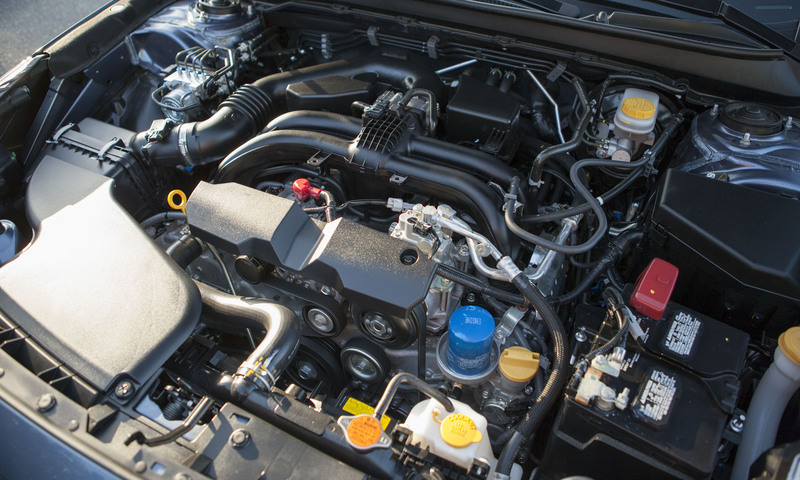 Subaru expects most buyers will opt for the 2.5-liter engine, which in our experience provides more than adequate power and impressive fuel economy. EPA ratings for the 2.5i are 26 city/36 hwy/30 combined, while those that go for bigger power pay the price in fuel economy. The 3.6 is rated at 20/29/23, respectively. 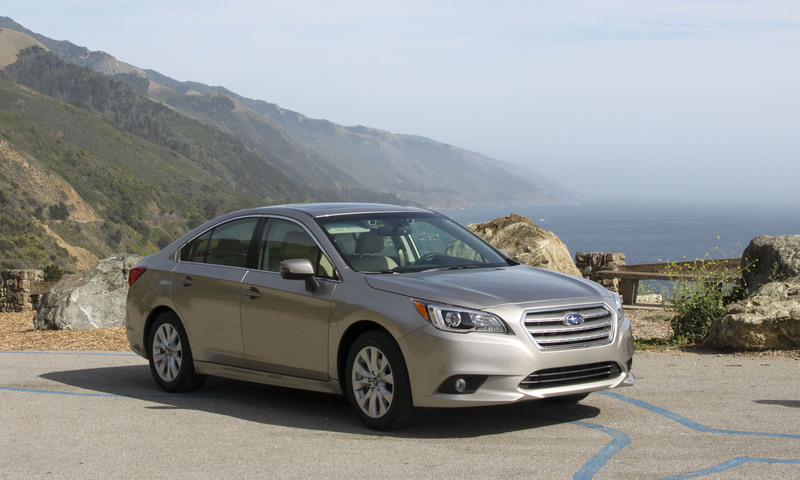 The new Legacy is slightly wider than the outgoing model, which makes a roomier, more spacious interior. Front seats in leather or cloth are supportive and comfortable, and there’s plenty of room in the rear seat for two adults. 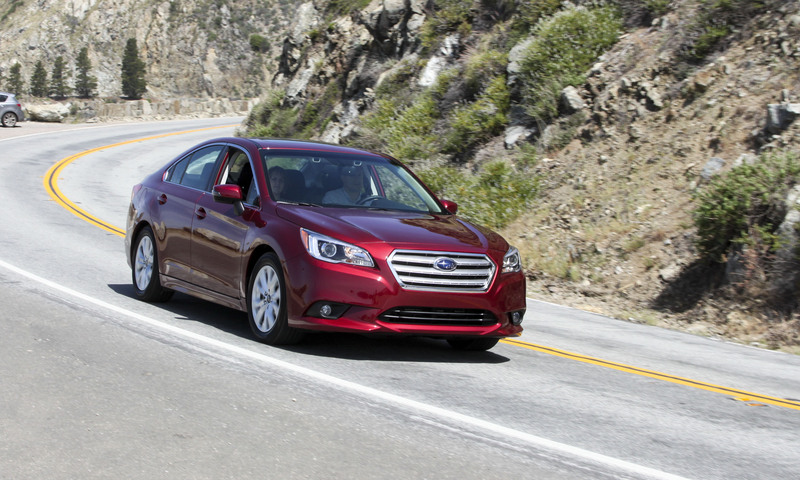 A long road trip in the Legacy would not be a problem. The trunk offers plenty of space for some large luggage; however, the opening is a bit small. The most welcome change is the updated infotainment system. Legacy has always lagged behind the competition on this feature — but no more. The large screen is easy to read and you can pinch zoom with two fingers like a tablet or smartphone. 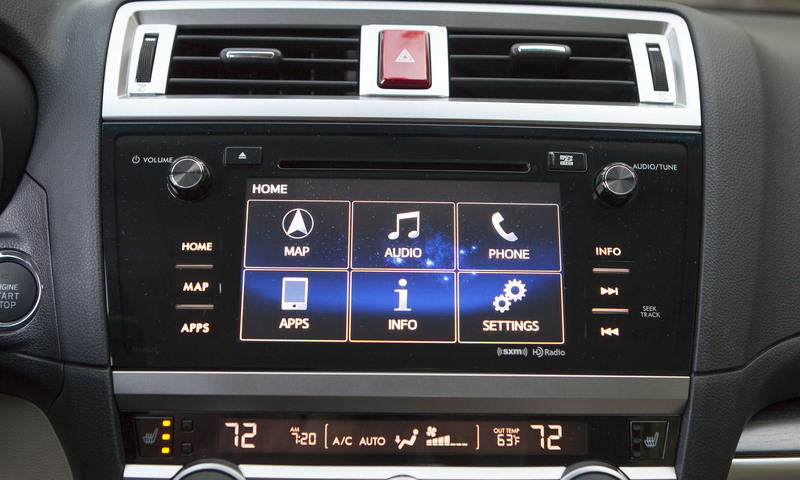 Buttons alongside the screen make audio system, navigation, and other features easy to find. Climate control functions are separate, and thus always accessible. We had a chance to take the Legacy down some twisty roads along the Pacific Coast and we happily detected a little WRX DNA infused in the Legacy. 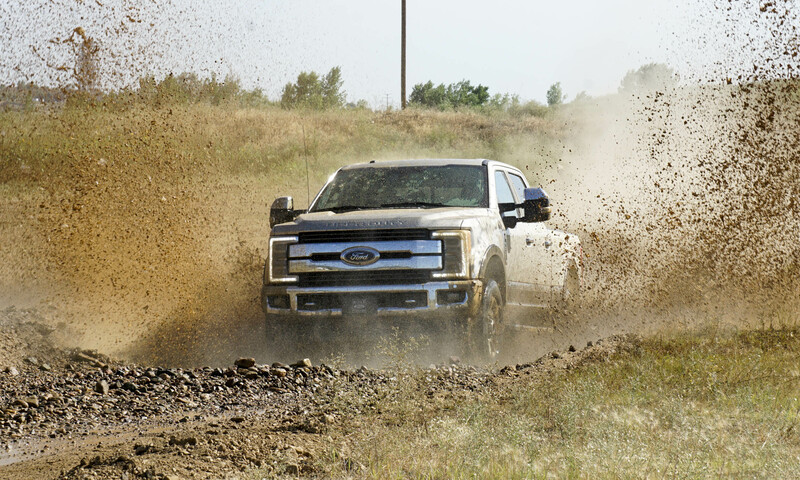 Pinpoint steering feel and the new firm suspension help drivers handle tight corners with ease. In addition to the added grip of all-wheel drive, the Legacy now uses torque vectoring, which applies braking to the inside wheels in a turn to help eliminate understeer. Although neither engine makes the Legacy a performance sedan, with 80 more horses the 3.6R is considerably quicker than the 2.5i. 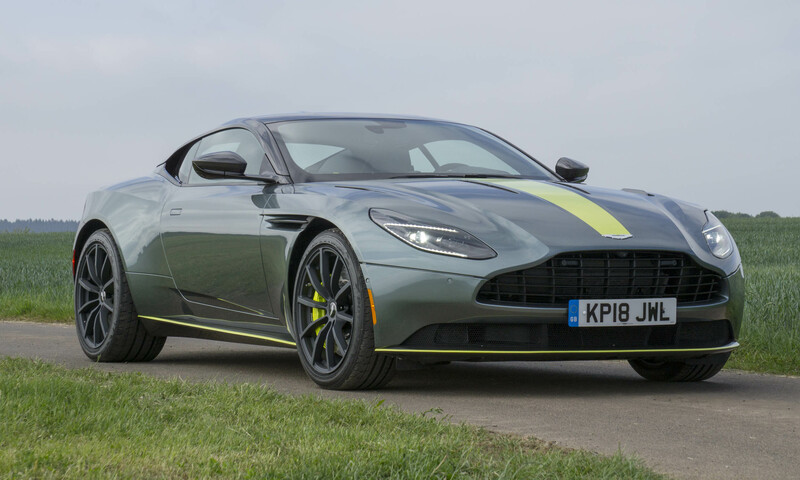 Sixty mph arrives in about 7 seconds — about 2 seconds quicker than the 2.5i and slightly quicker than the outgoing generation. The 3.6 possesses plenty of passing power, and the CVT seems to enhance power rather than sap it. Obviously the 2.5i needs to work harder to get up to speed, but it’s relatively quick off the line and for most situations doesn’t feel underpowered. Although typically we’re not fans of CVT transmissions, Subaru’s CVT is one of the best on the market, and it’s a value-add for the Legacy. 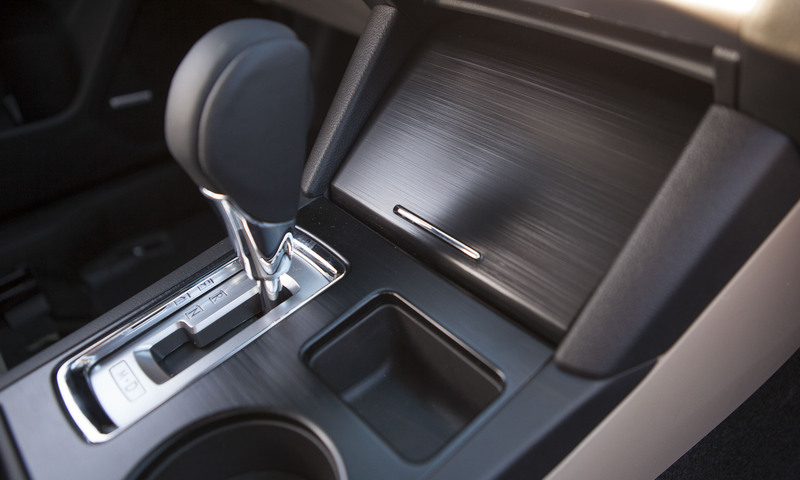 Simulated shift points give the feedback of an automatic transmission while providing the fuel-efficiency advantage of the CVT. 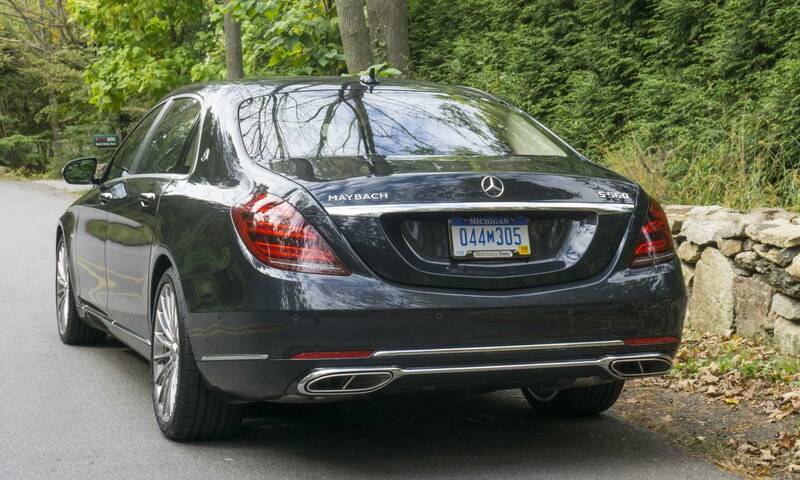 Even in traffic with lots of hills and curves we achieved 29 mpg with the 2.5-liter engine. Subaru’s camera-based Eyesight driver-assist system is much smaller for the new Legacy, and considerably less obtrusive mounted behind the rearview mirror. 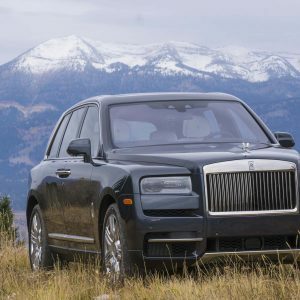 It also provides 40 percent greater range, which means it can react faster to decelerating vehicles — it even recognizes brake lights. The adaptive cruise control performs well in varying traffic speeds. Although the lane-departure warning can get a bit annoying at times, being gently alerted when cars in front of the Legacy start moving from a standstill is much kinder than the staccato horn honks of impatient drivers behind you. Significantly improved over the outgoing model, the new Legacy stacks up impressively well against the competition. Legacy pricing starts lower than two big players in this segment — Toyota Camry and Honda Accord — and adds the benefit of all-wheel drive as well as better fuel economy. 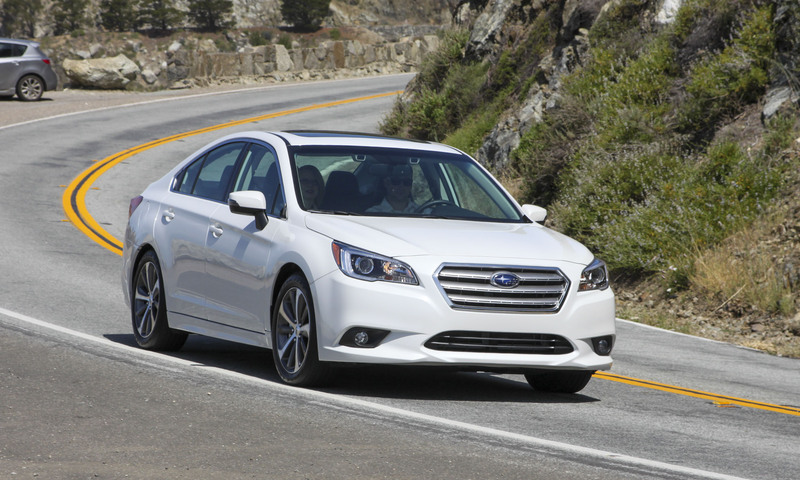 With an improved interior, tasteful exterior styling, roomy cabin and great driving characteristics, the Legacy should be on your shopping list if you’re in the market for a new midsize sedan — you’ll be pleasantly surprised. Bottom Line: With all-wheel drive, great fuel economy, attractive styling and a low starting price, it’s hard to justify buying any other midsize sedan. I really think this Subaru 2015 is the best among all. Thanks for a very good write up. You nailed it. All of the necessary details about it are present. I will not allow myself to forget sharing this. I as well have had to replace windshilds on my 2015 legacy (purchased 9/14). The stock windshild cracked due to tinny debris. Then replaced (at the dealership) with a second windshild that recently suffered the same fate. I have never experienced such a fragile windshild. Coincidence? Doesn’t sound like it. I have found other claims about the outback windshilds aswell. I now have over 7,000 miles on my 2015 Legacy (bought in March, 2015) – 10 days ago, a windshield crack suddenly appeared. 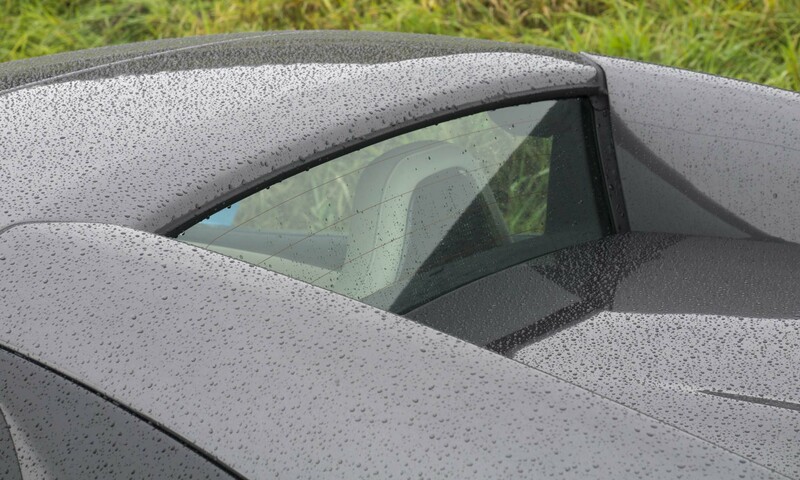 The dealer noticed a little ding just below the passenger-side windshield wiper… “you know those those Michigan roads…. !” I’ve never had a non crash-related cracked windshield in my many years of owning cars! Reading other Subaru forums have revealed that this doesn’t seem to be a unique problem for these cars. What’s particular grating is the fact that the replacement windshield for my Legacy is BACK-ORDERED!! That seems a bit strange to me! One more issue that my dealer is NOW aware of – the Blind-Sport Detection (and Lane-Change Assist) VERY periodically (2-3 times a week) is disabled when the car is started; the only way to reset it is to shut the car off and then start it again. Like I said, this is a problem that Subaru is addressing (I’ve been told). Other than these 2 issues, I’m VERY satisfied with my Legacy!! My 3.6 is loud too. Anyone think it is the Eagle LS2 tires? 2015 Legacy. Spontaneous windshield crack at <2,500 miles. Dealer not helpful at all. SUBARU HAS A CUSTOMER RETENTION PROGRAM – complaint to be filed in morning. To boot replacement glass not currently available due to manufacturing problems!!! I’ve owned my 2015 Legacy for 13 weeks and have experienced 2 windshield cracks requiring replacement. I live in a metro area and haven’t taken the vehicle off road. Wind/road noise is louder than other cars, but tolerable. Love the design and roominess, but the windshield design needs a thorough review. It seems there is something wrong with the design to allow it to crack so easily. I wonder if the glass is thinner to support eyesight operation. Bought my first Subaru, a Legacy Limited 2.5i (leather, moonroof, infotainment system w. 7″ screen, blind-spot warning, push-button start, keyless entry/trunk access). handles great, not fast, but fun to drive. Front seats are a little hard – my 55 y.o. wife uses a seat cushion for comfort. OEM speakers sound great. Great view out. Not the quietest car, but acceptable levels of noise. So far we like the car and hope that we can have it for 10 years – we traded in our 10 y.o. Camry XLE (the quietest car we ever owned!!). Legacy just made my go see list. I want to see how my 6’4″ frame will fit in that cabin. I purchased a Legacy Premium 2.5i Limited, Lapus blue, and couldn’t be more satisfied and very pleased. I have had none of the problems cited above. I have about 4500 miles and have gone on several long distance trips. My wife really enjoys the comfortable seat and especially the heated seats. I purchased a 2105 Legacy 2.5i Limited 7 months ago. It has 1906 miles on it, been in the shop (Dealership) about 11 times for multiple problems, e.g. gas door, excessive cabin noise, bad battery, inoperable windshield washer, defective window switch (passenger door)and I replaced the windshield that just cracked as I was driving, service department said it had a small ding ? I have 2011 Outback 2.5 limited and it has never had a problem. I really like the 2015 Legacy, however quality control problems and the cabin noise have caused me to lose confidence in it. Red, 2015 Legacy 2.5iLimited for Sale ! Thomas I have a 3.6 and it is loud too. Do you think it’s the Eagle LS 2 tires? I purchased a 2015 Legacy Limited edition in the end of January. Since then, I have replaced the front windshield 4 times. When the windshield breaks it is 6-12 in at a time and does not allow for repair. The crack spreads quickly. The dealer said that this is due to bad luck. Is there anyone else having this issue.